Visitors frequently arrive in Istanbul with an itinerary full of grand mosques, opulent palaces, and labyrinthine bazaars that characterize the UNESCO core of the city. A relative few seem to make it beyond the boundaries of Sultanahmet (i.e. the Old City), or are even aware that physical remnants of the ancient Istanbul walls still exist. EXPOSURE Largely exposed to the elements. Prepare accordingly. KID FRIENDLY? : The walk on surface streets is child-friendly. However, exercise extreme caution when climbing/walking on ramparts with children. Constantinople (Istanbul’s former Byzantine name) was once a heavily fortified city on a peninsula. Shortly after the founding of the city in 330 A.D., work began on a series of land walls to the west, where the peninsula joins the European continent. The walls were constructed for the usual purposes of keeping invading marauders out–and the good times in. 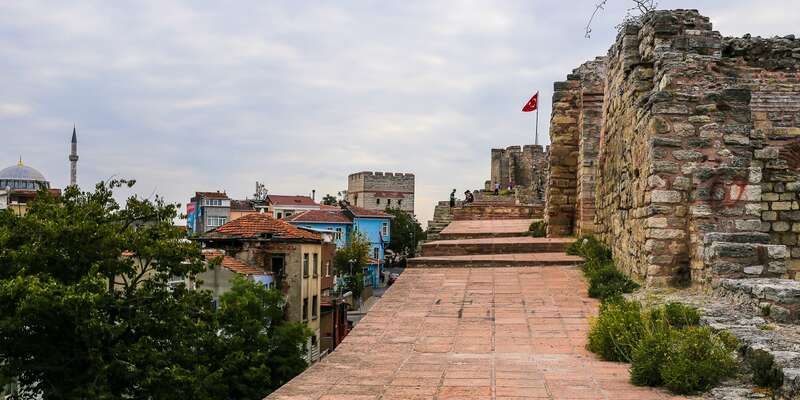 A century later, the Theodosian Wall was constructed farther to the west, enlarging the city significantly. 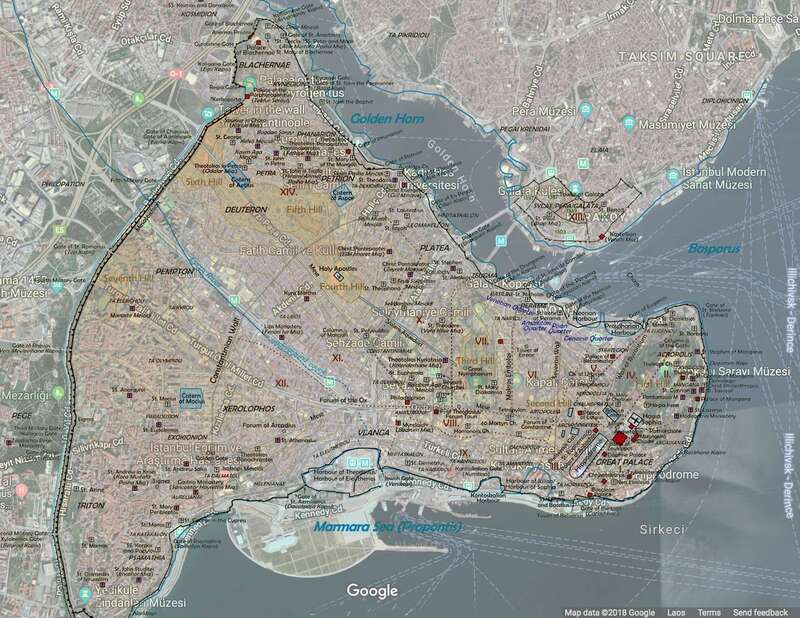 Map of Constantinople showing original Constantinople wall and Theodosian Wall added later (Cplakidas / Wikimedia Commons), overlaid on Google maps satellite imagery. Click to enlarge. We walked along remaining stretches of the Theodosian land wall, which was constructed in the 5th century, A.D. Much of the original wall is either in poor shape or no longer exists. However, a handful of pockets of ramparts and fortresses have survived, some having been beautifully preserved and/or restored. Together, these make up what is known as the Istanbul walls (or Land Walls) today. Walking along the top of the Istanbul walls. 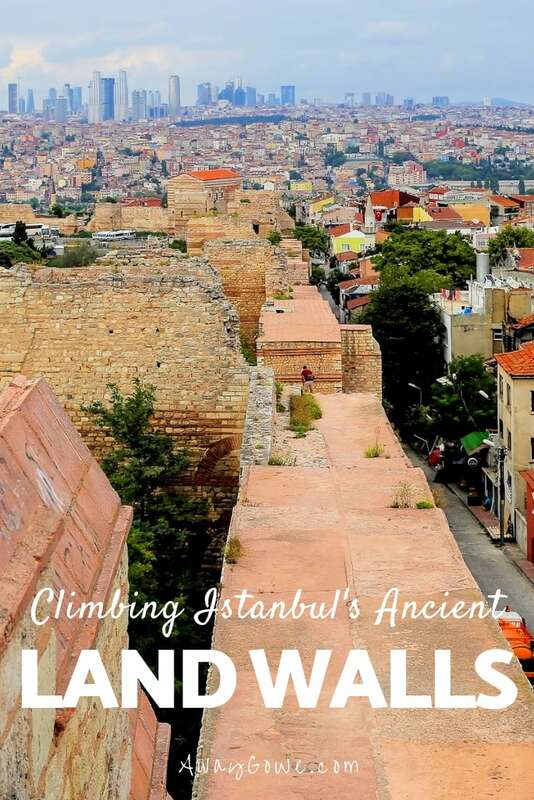 The Istanbul walls cut through a fascinating area of the city that differs significantly from the primary tourist centers, lending a far different perspective on daily life in this city of 15 million. Climbing the land walls, however, was the highlight of our trek (yes, you can even climb the ramparts in some sections! ), offering stunning views of the massive sprawl that is Istanbul in the 21st century. 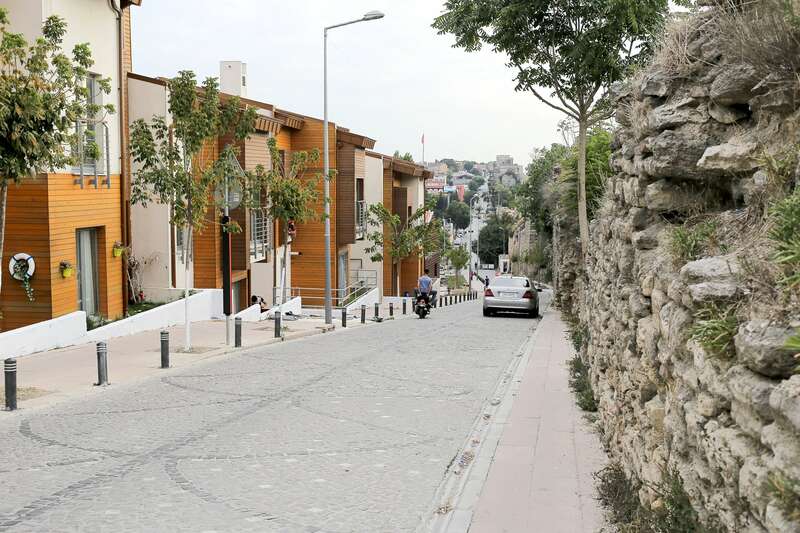 From the top of the ramparts, you can see all the way to Levent and Maslak, Istanbul’s two booming financial districts which are located some ten kilometers (six miles) to the northeast and are virtually invisible from the Old City. Istanbul is so sprawled out that it’s hard to fathom anyone ever coming close to exploring it all in a lifetime. 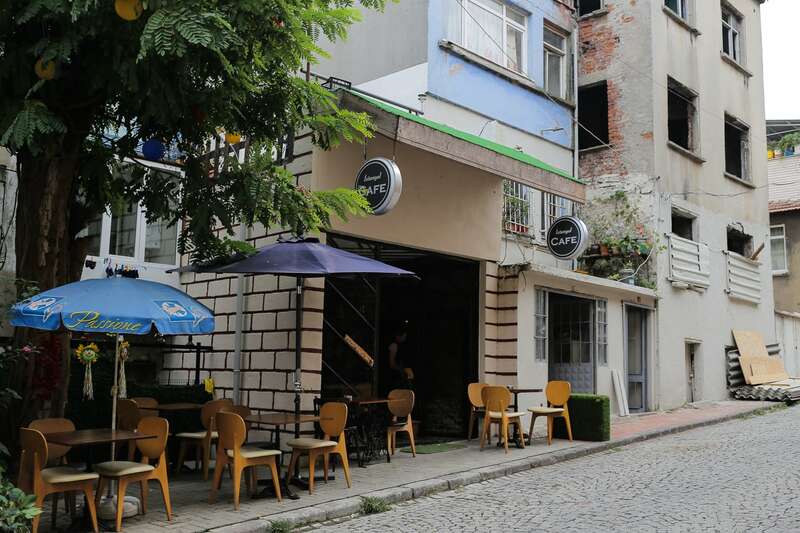 A sidewalk cafe along the Istanbul walls. While exploring the ancient land walls, we came across a coffee shop, perfectly positioned to take advantage of all two of the wall’s visitors (us) on this particular day. Nonetheless, the coffee was excellent, and the ambiance was even better. They even had seating in one of the old alcoves formed by a particularly mammoth portion of the ramparts. We did come across two other trekkers during our four-hour journey — a couple of young Turkish guys who seemed far more keen on snapping epic selfies than on the ruins themselves. And then there were the cats. 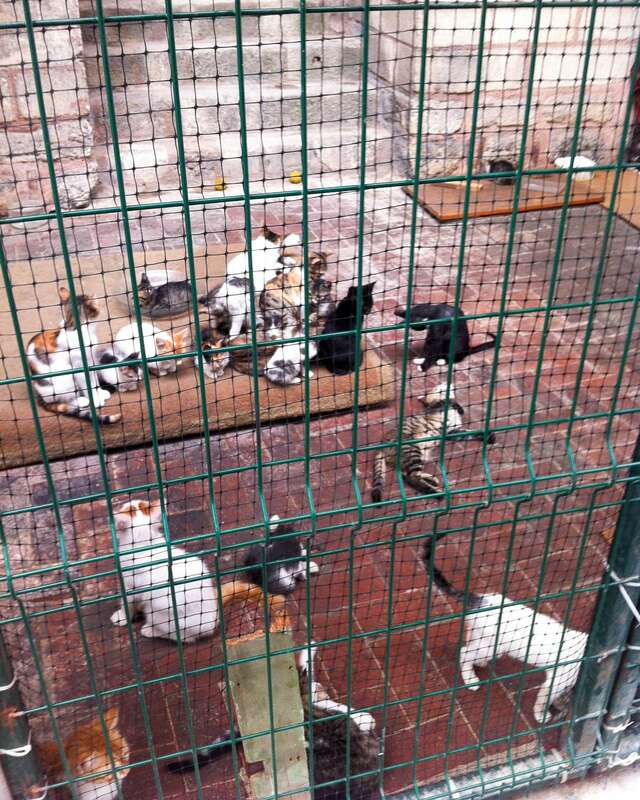 Lots and lots of cats everywhere in Istanbul. One local attributed the abundance of felines to Turkey’s Muslim roots, as cats are revered in Islam. The scene here at the land walls looks worse than it actually is. The cats seem to be confined, but to a very large series of chambers of an old fortress complex with plenty of room to roam. They also appear to be healthy and well fed. Now, why there are so many of them enclosed in this particularly area, no one could say. 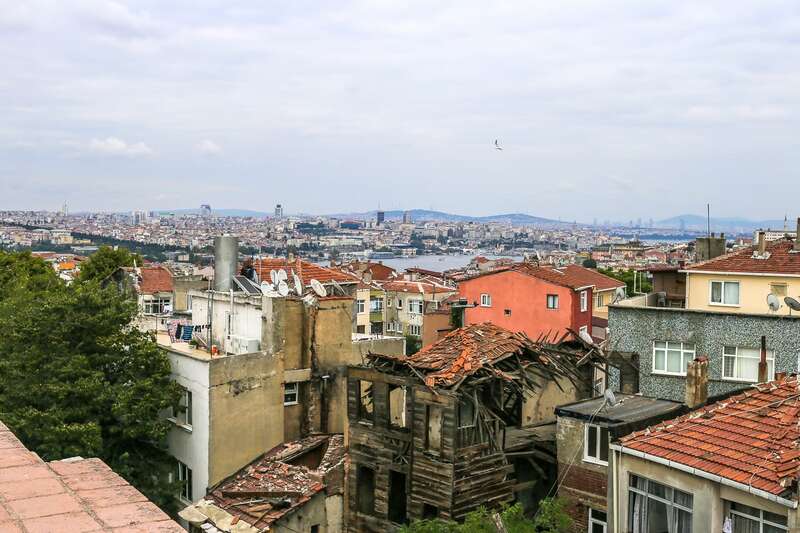 In addition to the amazing views and unique interaction with physical history, walking the length of the Istanbul walls also offers a glimpse into the city’s meteoric rate of gentrification. Our route began in a relatively run down area of town, but within blocks transformed into brand new luxury townhouses with high-end supermarkets, restaurants, and other fashionable amenities. 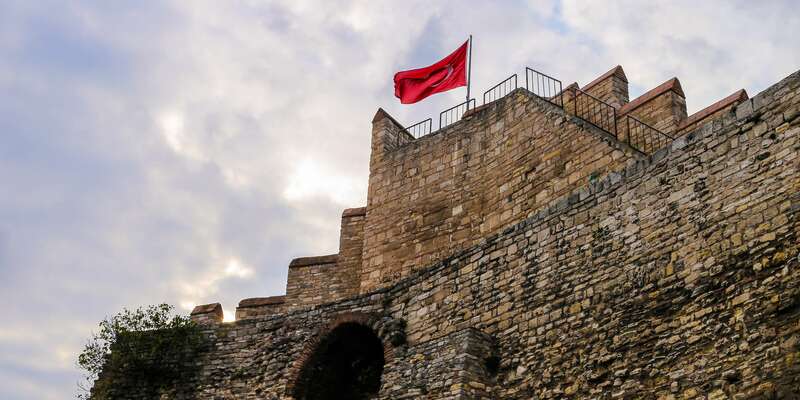 In many ways, exploring the land walls is a perfect way to wrap up a stay in Istanbul, immersing yourself in the city’s ancient past while gaining insight into Istanbul’s future.